Right, let’s get to the theme details page user interface. 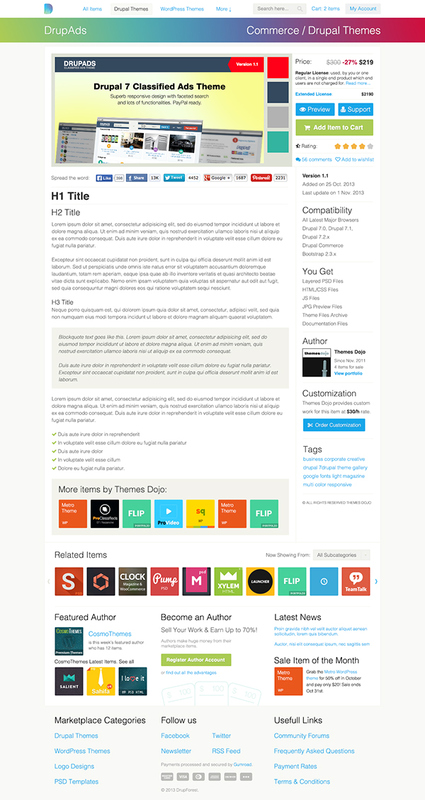 As you can see below, we’ve made space for several theme previews images, plus price discounts. We’ve enlarged the theme description area, so the author has more space for presentation. We have a separated field for theme version. There is a block with more items by this author + another block with related items from the entire marketplace. This way the author showcases more of his work and at the same time, the buyer sees interesting related products. Also, we’ve came up with a customization block, in which the author specifies for each upload whether he does provide or not customization work and what is his hourly rate. Theme Market Script is Almost Ready for Sale!